The giant ornamental rhubarb - Gunnera manicata is a near-hardy perennial native to South America from Colombia to Brazil. 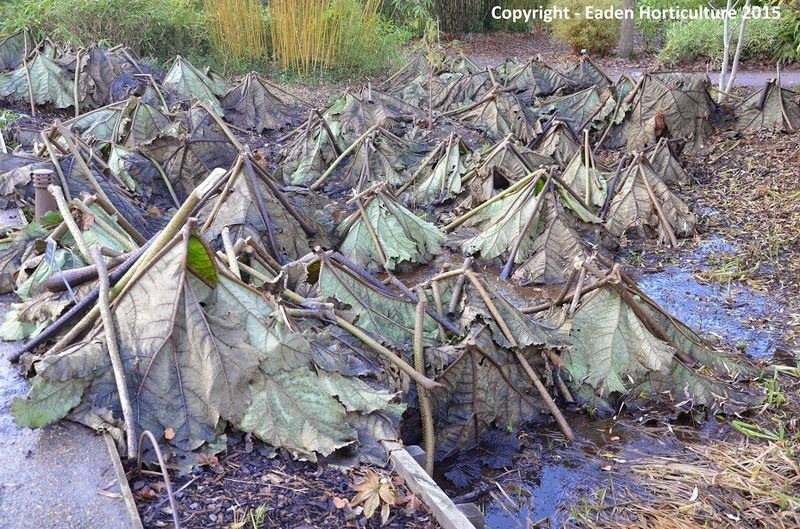 It will grow best in damp conditions such as the side of a natural ponds, but when grown in the colder regions of northern Europe the crown and near-surface roots can suffer damage under extended periods of freezing, wet conditions. Traditionally, the crown is protected by covering it with its own leaves either weighed down with soil or secured in place using small branches or its own leaf-stems. This procedure is usually undertaken after the first light frosts in October. As soon as the leaves begin to show the effects of cold damage they can be removed but if the weather's still warm then delay cutting as the heat will cause warm, humid conditions around the crown which can encourage fungal infections to take hold. 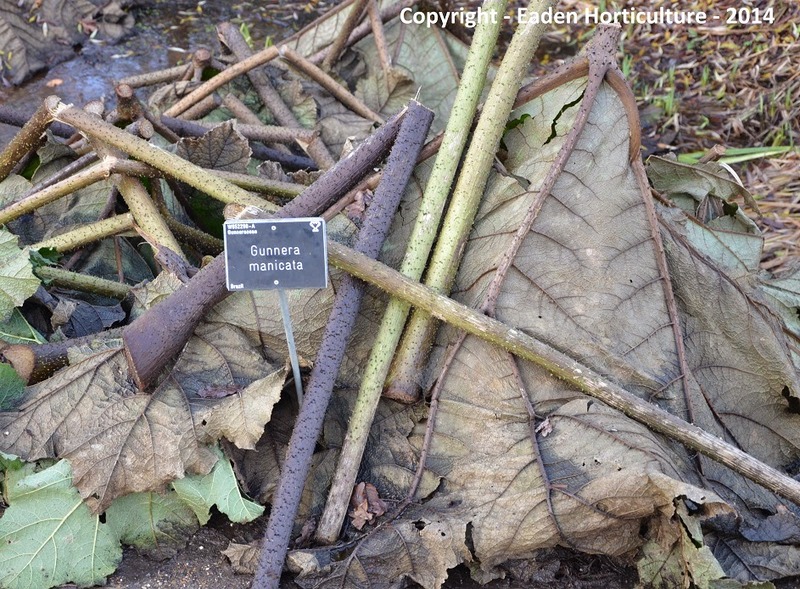 Be aware that the stems and undersides of Gunnera leaves are covered in thick spines so unless you have the gnarled hands of a northern bricklayer you should wear thick, protective gloves. While the spines are not sharp enough to puncture the skin, they are quite capable of inflicting deep and painful scratches. First remove the leaves by cutting the stems near the crown using a sharp blade or silky saw. Then remove the stems by cutting them away from the base of the leaf. Any flower or seed stalks can also be removes and placed around the crown for extra protection. First, cover the top of the crown with 2 or three leaves, then place the remaining leaves in a cone shape around the crown. The leaf-stems can now be place on top of the leaves to help keep them in place. Young plants may not have produced enough leaves during the growing season to provide itself with enough protection. In this instance provide a thick mulch of straw instead and cover that with whatever leaves are available. In the spring the leaves and soil can be drawn aside to expose the crown, but left in place to act as a mulch.